You can opt to become a practical nurse or a registered nurse. To learn the skills you need to become a nurse, you need no prior experience. For instance, AIAM’s 24-month Registered Nurse program does not require any nursing experience. You also have the opportunity to learn outside the classroom setting, in clinics or hospitals. You can also opt for specialized tracks that use different nursing care approaches, such as alternative or holistic treatment. While typical degrees require four years of completion, you can train to be a nurse in shorter timeframes. For example, you can learn to be a registered nurse (R.N.) in as little as 15 months when you opt for the Advanced Placement Track at AIAM. This program helps those who already have an LPN or degree sans license to accelerate their training. Even starting from scratch and becoming a R.N. is possible with AIAM’s 24-month Registered Nurse program. Being a nurse also comes with the benefit of job security. There continues to be a growing job market for nurses. According to the Bureau of Labor Statistics, the job outlook for registered nurses is much faster than the average growth rate for other occupations, at 15 percent between 2016 and 2026. Moreover, registered nurses can earn a wage that is often higher than the median household income, at $68,450 as of 2016. Licensed practical nurses (LPNs) and licensed vocational nurses (LVNs) also have a promising job growth rate and job security potential. The job outlook for LPNs and LVNs is at a growth rate of 12 percent, which is also much faster than the predicted growth rate of other occupations. LPNs and LVNs made a median annual salary of $44,090 in 2016, which is the latest data (as of 2018) for job outlook provided by the Bureau of Labor Statistics. 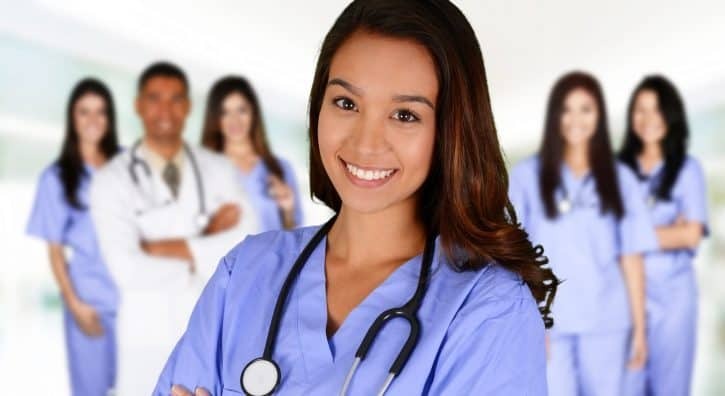 Being able to work after obtaining your degree, diploma or certification is vital for putting what you know to use, starting paying any outstanding school loans you may have taken out for your nursing education, and beginning your career as a nurse. That’s why one of the best reasons to become a nurse is the ability to start working in your field soon after completing your studies. The nursing field offers gainful employment that leads to quality job opportunities. For example, about half of the students who graduated from American Institute of Alternative Medicine’s Undergraduate certificate in Practical Nursing program got jobs in the fields of licensed practical nurses (LPN) and licensed vocational nurses (LVN), based on findings from the state’s and accreditor’s job placement rates. A nurse’s job is far from mundane. In fact, nurses have some of the most diverse roles in the healthcare industry. That’s because as a nurse, you can expect to carry out a variety of tasks. For example, a LPN’s duties can vary from educating patients on healthy lifestyle options in the clinic or doctor’s office to maintaining a patient’s medication. Even during training, you can expect to experience learning in different settings, from long-term care facilities to physicians’ offices. For instance, AIAM’s PN Program prepares you to be a licensed practical nurse with hands-on experience at local clinics in Columbus, Ohio. As a nurse, you don’t have to stay in one location if you don’t want to. Nurses have many opportunities to travel. Whether you choose to travel across the state or across the country, you have the opportunity to see new places and meet new people, all while gaining expertise in the field of nursing. One of the most fulfilling reasons for becoming a nurse is a chance to change and impact lives in a positive way. Nurses learn to focus on the emotional needs of their patients. With appropriate training, you learn why it’s important to be empathetic and understanding towards your patients’ emotional needs. This training helps you to deliver the care that patients need, and it often enhances the patients’ experience while in your care, as well as giving you a chance to change their lives. The field of nursing offers a variety of promising financial, emotional and educational benefits that make this job fulfilling for those who decide to choose this career. Some of the best reasons why a nursing career is worth pursuing are linked to opportunities that help to transform not only your life but also the lives of the patients you meet — and their families. If you’re considering a career in nursing, get the quality education you need from a reputable school, such as the American Institute of Alternative Medicine. Apply today!